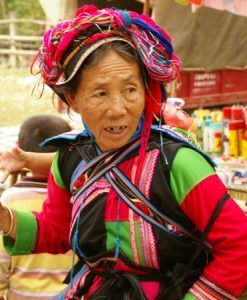 This tour in Yunnan includes the presence of a quality English speaking guide and a driver every day. 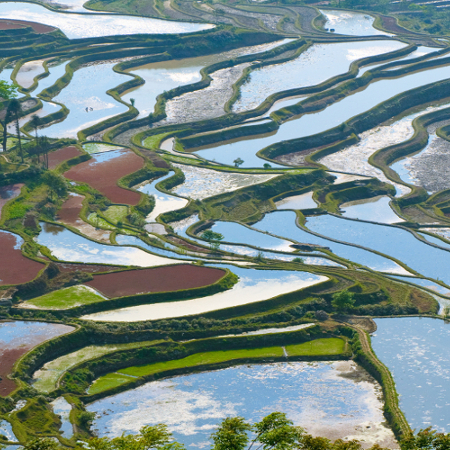 This trip of 13 days on the spot, 15 days from France, is ideal for a first visit of Yunnan. We recommend it for a first approach of the province. 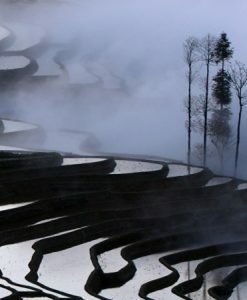 Some destinations can be explored, including the discovery of rice fields and markets around Yuanyang where you can add a day, also the Dali region with a nice day trip to Weishan and Weibaoshan, or the discovery of the region from Benzilan to the north of Shangri La, to name only possible excursions for an extra day. If spring and fall are the best times, this program can be done all year long. There will be some extra rain in the summer, but nothing too troublesome for this circuit. Winter will be a little colder, especially in Shangri La, but we will make sure that the hotel is well heated! Arrive during the day at Kunming Airport. Welcome by your driver (with a sign to your name) at the exit of your flight, then transfer to the Grand Park 5 * hotel located in a pleasant area of ​​the center of Kunming. Rest of the day free to recover from your long flight, and make some first visits quietly on foot from the hotel. You can walk to the Emerald Lake, where locals love to walk, sing, dance and play music. Possibility to extend to the Buddhist temple of Yuantong located 5 / 10min walk. Dinner (not included). Meeting with your guide and driver at 8:00. Long day drive to Yuanyang. 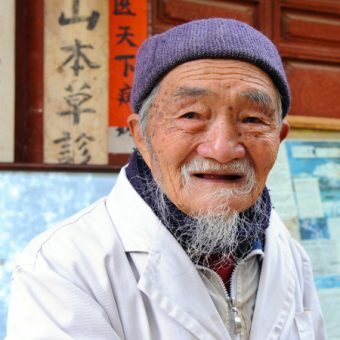 Halfway through, stop at Tuanshan village, and have lunch with a family living in the heart of the former Zhang family residence, located in the heart of the village with protected architecture. Discover the beautiful old bridge of the double dragon, before continuing the road to the rice paddy area of ​​Yuanyang, to the small village of Duoyishu. Installation at the friendly Jacky’s Guest House located in front of the rice terraces. Dinner at the inn’s restaurant (not included). 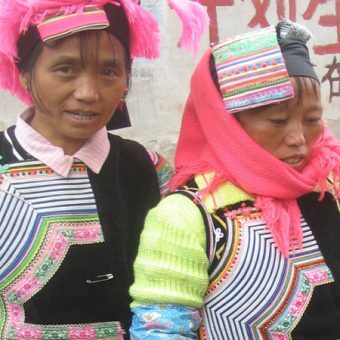 After breakfast, depart for a village in the Yuanyang area to attend the morning market (set according to the day in the Chinese lunar calendar). Meeting with different minorities, including Yi, Hani and Dai. Continue to a small village where a show of songs and dances was set up by the villagers belonging to the Yi minority. 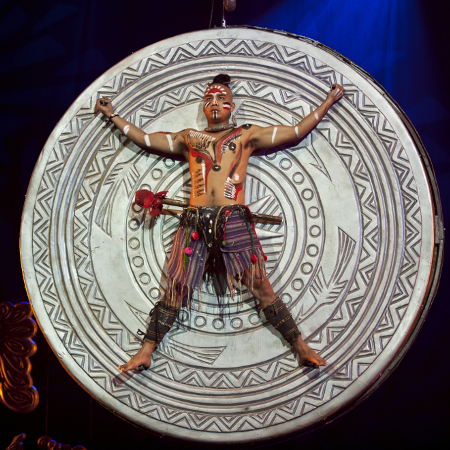 Charming and touching … Note that all the proceeds of the show will be directly donated to families. A lunch will then be served to one of the families who participated in the show. 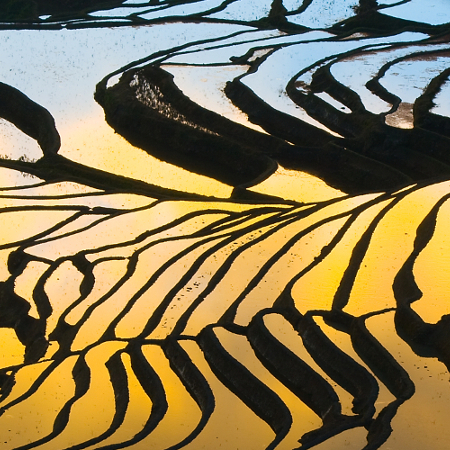 In the afternoon, hike from 2 to 3 hours through beautiful landscapes of rice terraces, and small villages. Dinner and overnight at Jacky’s Guest House. Breakfast at the hotel. Possible visit of another market in the Yuanyang area, before taking the road to Jianshui. Lunch along the way. 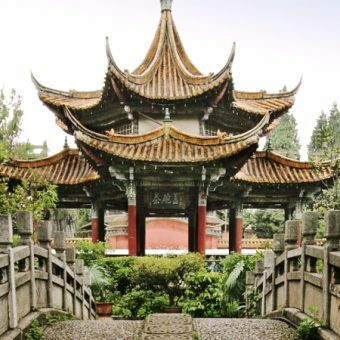 In the afternoon, visit the Temple of Confucius, which is the second largest in China after that of Qufu, the birthplace of the master. 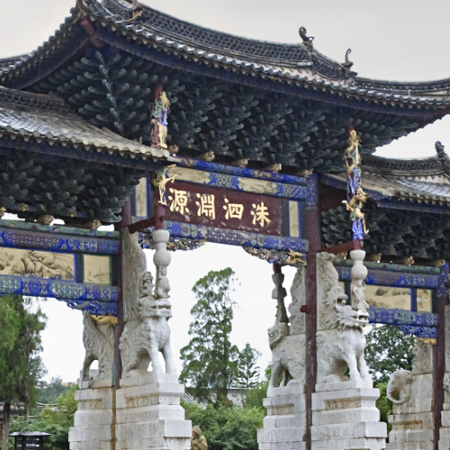 The set consists of a large park with pond, several courtyards, beautiful porticos, temples and pavilions. 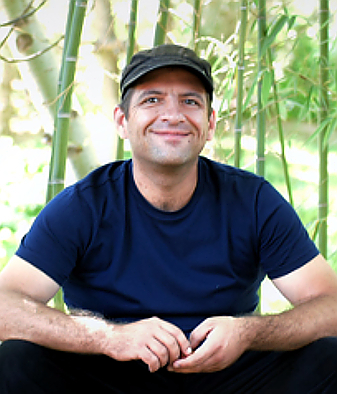 Visit a local tofu factory if time permits. Installation at the 3 * boutique hotel in the beautiful residence of the Zhu family, one of the best preserved in Yunnan, consisting of a set of courtyards, pavilions and gardens. Dinner (not included). Walk through the old town of Jianshui to the Chaoyang Arch, which is home to a small bird market. On the way back to Kunming, visit the small town of Tonghai and Xiushan Mountain. Dinner (not included). 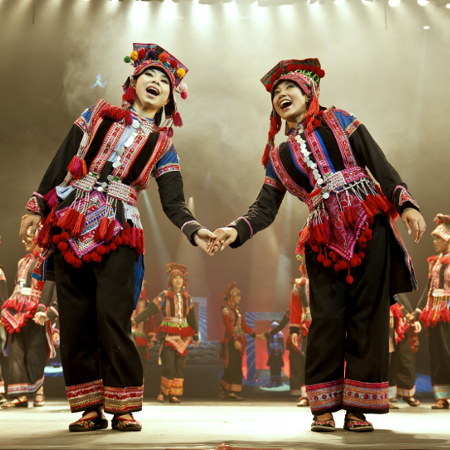 In the evening, attend Yunnan’s beautiful Yunnan minority dance and song show “Dynamic Yunnan” (8: 00-21: 30), before transfer to Kunming station for the night train (soft berth) to Dali: departure at 22:47, arrival at 7:22 am (times may change slightly). 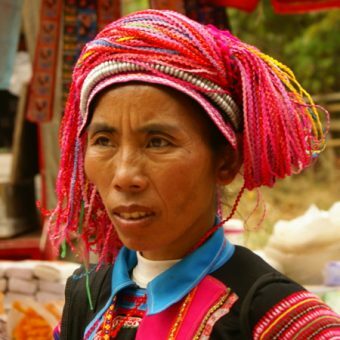 Meet with your guide and driver on your arrival at Dali station. Transfer to the old town of Dali for breakfast, then stroll through its old streets, still quiet at this time of day. Continue to the pleasant Bai minority village of Zhoucheng, to meet its inhabitants (learn more about the batik dyeing process, practiced here for generations) and its old but charming little temples. Then transfer to Xizhou. Installation at the beautiful and comfortable Linden Center boutique hotel, built in a beautiful traditional Bai mansion, and equipped with all modern comforts. In the afternoon, you can rest at the hotel, discover by bike (available at the hotel) the surrounding countryside to Lake Erhai, otherwise walk through the village of Xizhou, including beautiful old houses. Note that a tour of the hotel is organized by the Linden Center every day at 17:00, in English, presenting the history and architecture of the places. Dinner (not included). 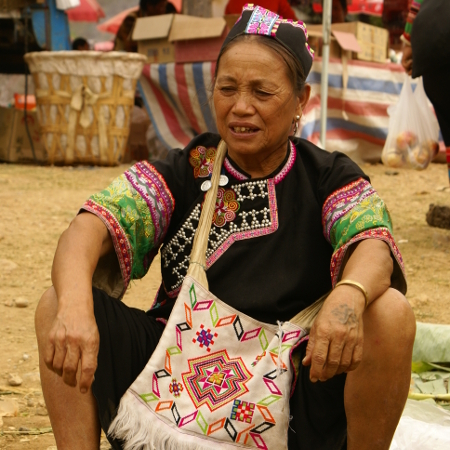 Visit Xizhou Morning Market, walk from your hotel. Then drive to Shaxi. Lunch en route. 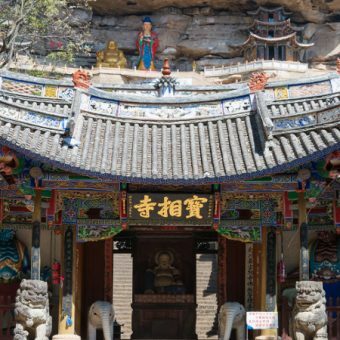 In the afternoon, discover the Shibaoshan Mountains, a superb set of Buddhist sculptures carved into the rock and zen temples. After the visit, walk down a small path leading to the old town the city of Shaxi, if not by car. Discovery of Shaxi, former big trading center on the caravan route of tea and horses. Accommodation in the heart of the old town at Laomadian Inn, a former caravanserai superbly refurbished with all the necessary comforts. Dinner at the hotel restaurant. Road to the Tibetan region of Shangri La. After the city of Jianchuan, discovery of different stages of pottery making in a rustic roadside workshop: the kneading of the earth by buffalo, shaping pottery, the loading of the front kilns cooking (attention: visit possible only if the artisans are at work!). Second stop of the day at the site of the first curve of the Yangtze, and walk through the small village of Shigu. 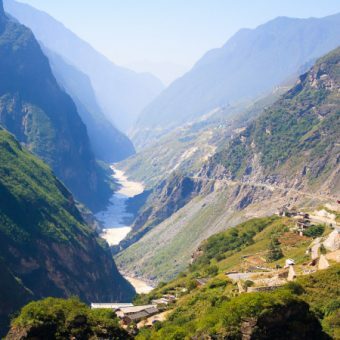 Continue to the Tiger Leaping Gorge, among the deepest in the world in which flows the Yangtze River, between the Haba Mountain (summit at 5400m) and the Jade Dragon Mountain (summit at 5600m). Small walk back 40 minutes to access the bottom of the Gorges (many Chinese tourists to this place, but not too much alternative to apprehend the site). Continue on a beautiful mountain road to Shangri La. 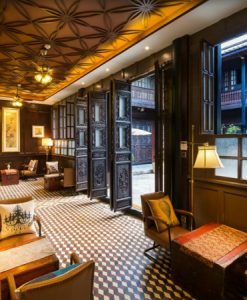 Upon arrival, check-in at the Timeless Inn B & B in the heart of Shangri La Old Town, a two-minute walk from the small square where the premises dance at the end. of day. First stroll through the old town of Shangri La. 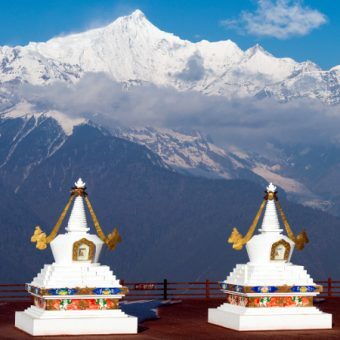 Visit Shangri La and its region, starting with the beautiful Tibetan Songzanlin Monastery. Walk to the local market, then walk through the old town, including the Bai Ji Si temple with beautiful views of Shangri La and the Shika Mountains. Note that the central part of the old town was ravaged by fire on January 11, 2014. Lunch (not included). In the afternoon, explore on foot or by bike the Tibetan countryside (several possible routes, to discuss in the morning with your guide according to your desires and abilities). Random stop of the road and your meetings with a Tibetan family, always welcoming, to taste the Yak butter tea, “Tsampa” and Yak butter cheese, local specialties and bases of their daily food. Attend and participate if you wish in spontaneous dances in the evening of locals in the Old Town Square. Dinner (not included). Overnight at your bed and breakfast. Morning route to Lijiang. Lunch in the heart of Lijiang’s old town, and stroll through its narrow streets, now very tourist and shopping, then to the park of the black dragon pond. 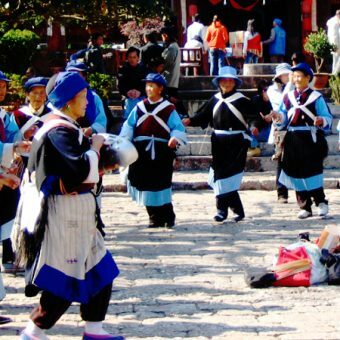 Find your car for the short transfer to the Naxi village of Shuhe, located in the heart of the Lijiang Valley. Installation at the amazing hotel The Bivou. Dinner (not included) in one of Shuhe’s many restaurants within walking distance of your hotel. 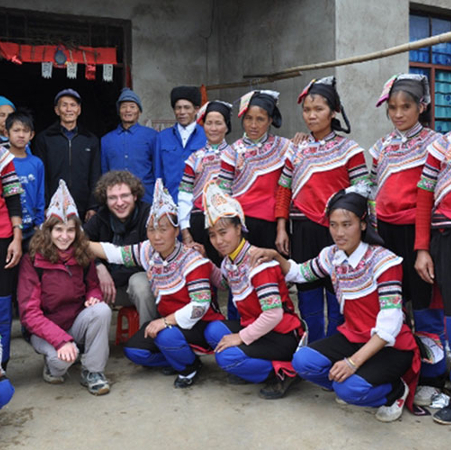 Bike ride in the Lijiang Valley, including the Naxi minority villages of Baisha and Yuhu, located at the foot of the jade dragon mountain. 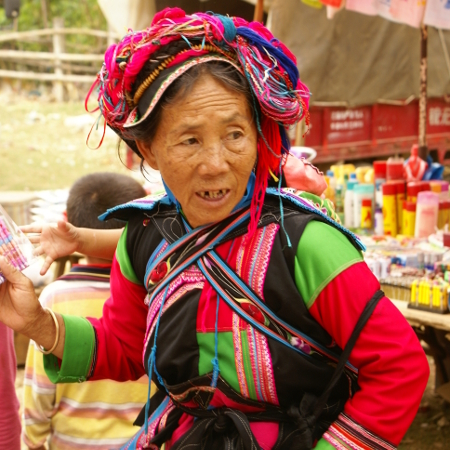 Numerous possibilities for stops and visits along the way, to discover the rural lifestyle around Lijiang. Do not miss the Mu Family Silk Embroidery School and Dr. Ho’s traditional pharmacy in Baisha. 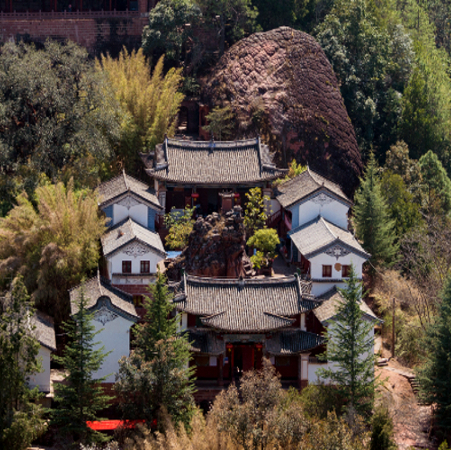 Back to Shuhe, a leisurely stroll through its bucolic and festive old town. Dinner (not included), then transfer to Lijiang station for the night train to Kunming (soft berth) departing at 21:30 (times may change slightly). The hotel has a security guard for your luggage. 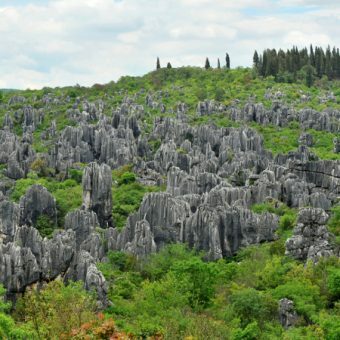 Free day (without guide or driver), before transfer to Kunming Airport for flight to your next destination. End of our services, we wish you a pleasant return home, beautiful memories in mind!